We caught an 8:30 am flight from Newark to Bozeman, which my husband purchased with 50k United points. Newark was an absolute madhouse – maybe because it’s summer or because it was Sunday, or both! Once we boarded our plane, things went very smoothly, with lift off even earlier than expected. Arrival was supposed to be 11:11am local time, but by that time we were actually already collecting our luggage from one of the three baggage carousels in this tiny airport, which btw looks more like an old, rustic resort than an airport. Here’s the reasoning behind our decision to fly into Bozeman. We did not want a flight with stops, so that brought down the choices to either Bozeman, Montana, or Salt Lake City, Utah. The advantage of Salt Lake City is that you drive through Grand Teton National Park on your way to Yellowstone, and everyone knows what Something Fishy has to say about that! However, my husband and I knew that we weren’t realistically going to wake up in the early a.m. while on vacation, even if it’s to watch “the most beautiful sunset in America,” and even if the daytime scenery is beautiful, we also really did not want to spend six hours driving from Salt Lake City to Tetons/Yellowstone. Bozeman is only 1.5 hours from Yellowstone’s North Entrance, and since we wanted to drive as little as possible, that clinched our decision. After getting our car at the airport, we stopped at the Bozeman Walmart to pick up a microwave (we had pre-ordered a small cheap one for pick up there, but cancelled that when we saw another one on sale for only $35) and some fresh vegetables. From there it was a smooth ride all the way to the park entrance. Only several miles from the North Entrance is the Mammoth Hot Springs area, so that was our first destination. After a quick stop at the visitor center information desk, we drove to the parking lot at the trailhead of the famous terraces. The first trail was short and easy along Liberty Cap. It’s hard to describe what we saw, but it was strange, beautiful, exotic… something I haven’t seen anywhere else. We then hiked a second, neighboring trail, which is quite steep and difficult with many steps. 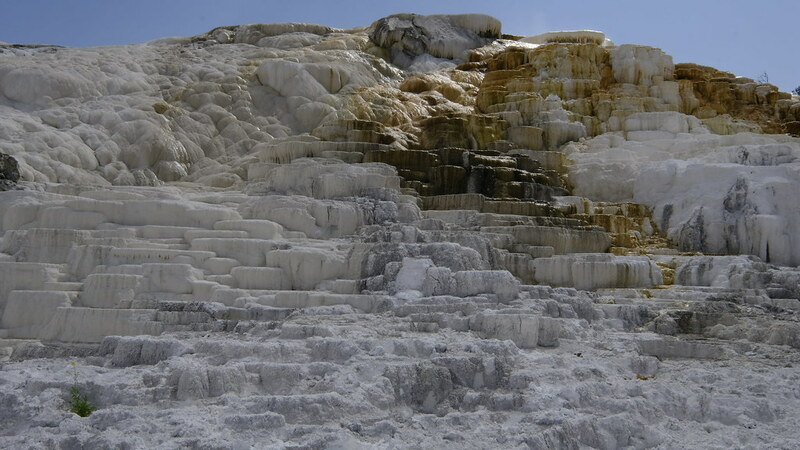 We saw Palette Spring, Minerva Terrace, and the breathtaking Mound and Jupiter Terraces before continuing all the way up to the observation point at the top, which is quite exhausting and completely unnecessary. The main road winds up right behind that observation point, with a small parking spot giving easy access to it. In retrospect, it would have been enough to hike halfway up the trail, until the Mound and Jupiter Terraces. There is an additional section called Upper Terraces, which I think has easier access and observation points right off the road, but we were too exhausted to move (we were up since before dawn to catch our flight and were adjusting to the elevation) so we just continued driving towards our next planned stop: Norris Geyser Basin. 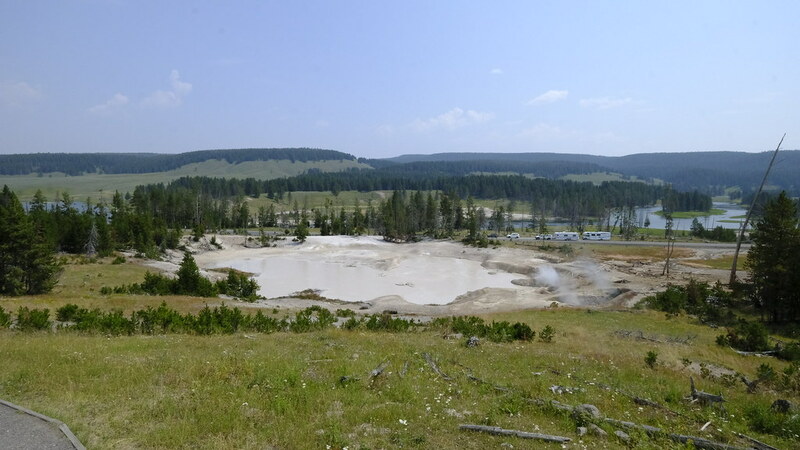 When we got to Norris Geyser Basin, there was a sign blocking the entrance saying that the parking lot was full. We were disappointed, but seeing no other option, we decided to continue driving towards Madison Junction and then the West Entrance. We had reservations for Sunday night at Days Inn in West Yellowstone, so that was our ultimate destination. I quickly began looking at my map and some information I had saved on my phone to find an alternate stop instead of Norris. Though we were both exhausted, we did want to do one more thing before leaving the park for the night. We decided to stop at Artists’ Paintpots, which is just a short distance from Norris Junction. Though I hadn’t planned it this way, I’m really glad at how our itinerary worked out. Artists' Paintpots is very unique and beautiful, with a relatively easy loop trail. The trail first winds around Blood Geyser, where there’s a boiling, bubbling spring and endless clouds of steam. My favorite feature was the bubbling white mud at the highest point of the trail, from where you can look down at the rest of the trail. The mud keeps bubbling like a pot of gravy, and every few seconds, some of it sprays straight up, several feet in the air. Just an amazing sight. After leaving Artists’ Paintpots, we encountered our first bit of traffic between Madison Junction and the West Entrance. It wasn’t too bad though, and soon we were at Days Inn West Yellowstone, which is minutes from the West Entrance. We had only reserved one night’s stay, since we planned to spend the next three nights inside the park. (FYI there aren’t really options for using points for any hotels in the park or the towns immediately bordering it.) The room was equipped with a microwave and we reheated some of the double-wrapped suppers we’d picked up at a local deli for the trip, ate supper, and called it a day. We checked out of the hotel Monday morning and headed into the park at around 10am. There was quite a bit of traffic between the West Entrance and Madison, with lots of guests heading into the park. It eventually cleared up, and after we turned south at Madison towards Old Faithful, things kept moving along nicely. We reached the Old Faithful parking lot with only 4-5 minutes before the next scheduled eruption. We kept circling the lot but couldn’t find parking. Finally, we saw a car parked on a tiny patch of grass at the end of a row of cars and we managed to fit our car alongside it. We hurried towards Old Faithful and it started erupting seconds before we reached the observation area. It keeps going for a while though, so we had time to get even closer and get some great shots. Afterwards, we headed into the Visitor Center to get oriented and plan our next move. 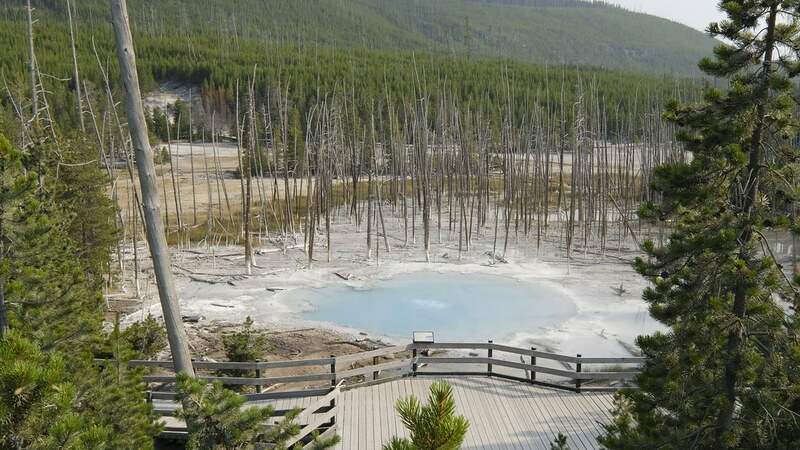 There are quite a few geysers and pools around Old Faithful which can only be accessed through hiking trails. We were happy to do some hiking but didn’t see the point of hiking for hours just to see each and every geyser. 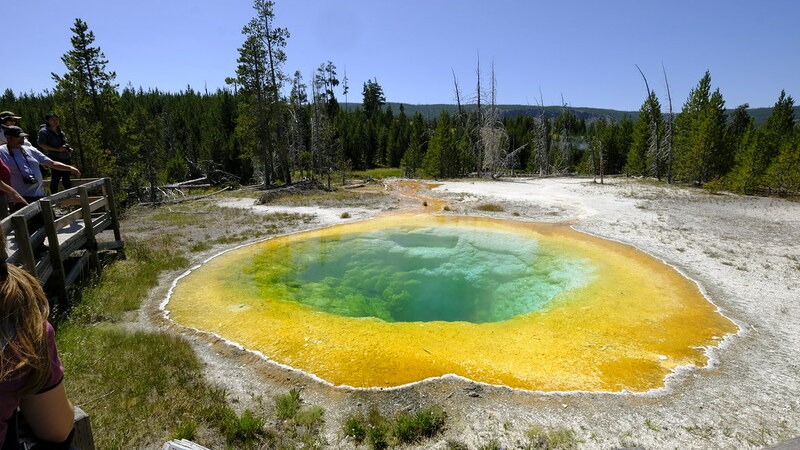 We decided to skip the Geyser Hill loop behind Old Faithful, and instead took the trail that ends at Morning Glory Pool, which I definitely wanted to see. 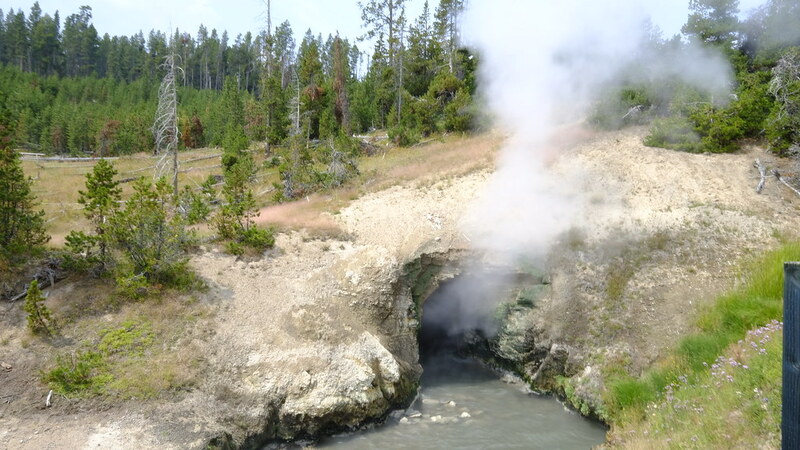 The first attraction on the trail is Castle Geyser, which you can literally take in with all your senses. You see the water and steam spewing from the geyser, you hear the roar of the water bubbling to the surface, you can feel the heat rising from the pool surrounding it, and you can smell the rotten egg smell, which comes from the hydrogen sulfide gas from the magma chambers beneath Yellowstone. Okay, I didn’t try tasting the water, so I guess that’s only four senses! 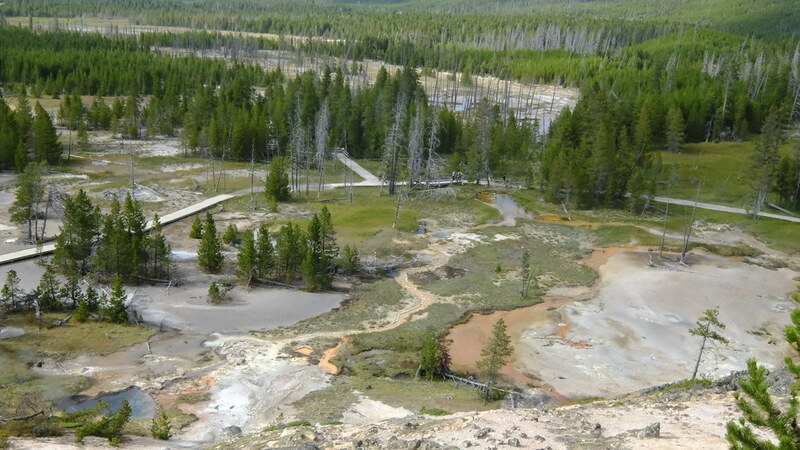 Right at Castle Geyser, you can turn onto an alternate boardwalk-type path (see left side of photo above) that crosses Firehole River and then parallels the main path, while offering access to Grand Geyser and other geysers and pools. It eventually rejoins the main path, just before Grotto Geyser. 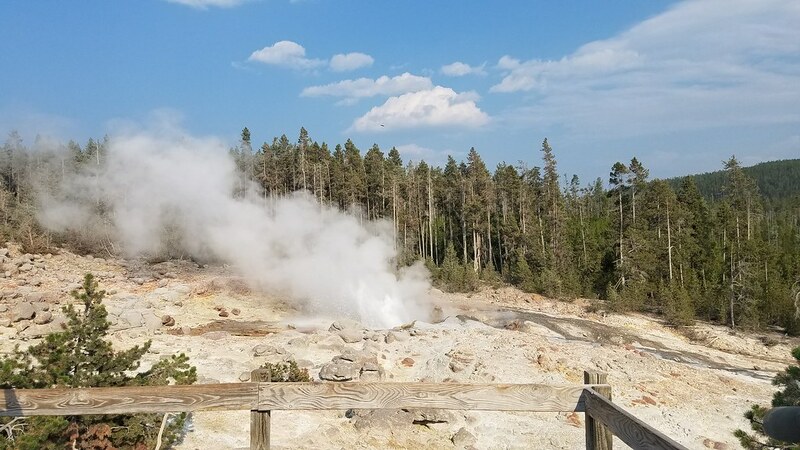 We took that detour, even though Grand Geyser wasn’t scheduled to erupt again until that evening, since the walking time is about the same and the path has additional attractions. As we were about to get back onto the main trail, we could see the geyser after Grotto, Riverside Geyser, erupting from afar. It erupts every 5-7 hours, and though it took us a few minutes to reach the geyser, it was still going strong when we got there. 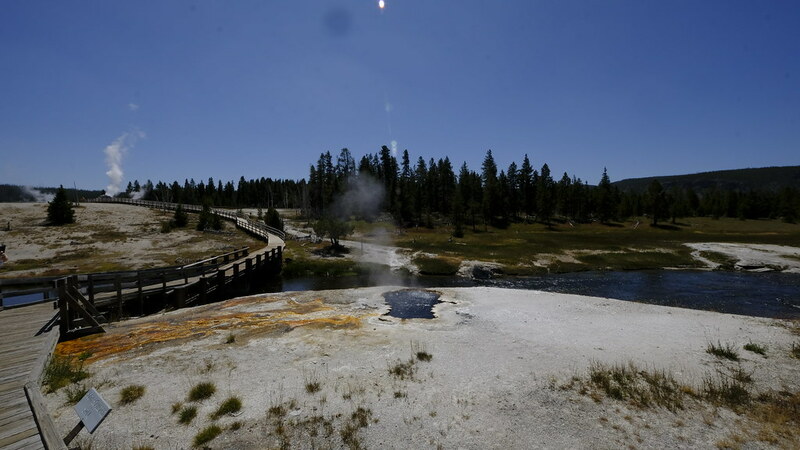 Turns out, Riverside Geyser eruptions last about 22 minutes. 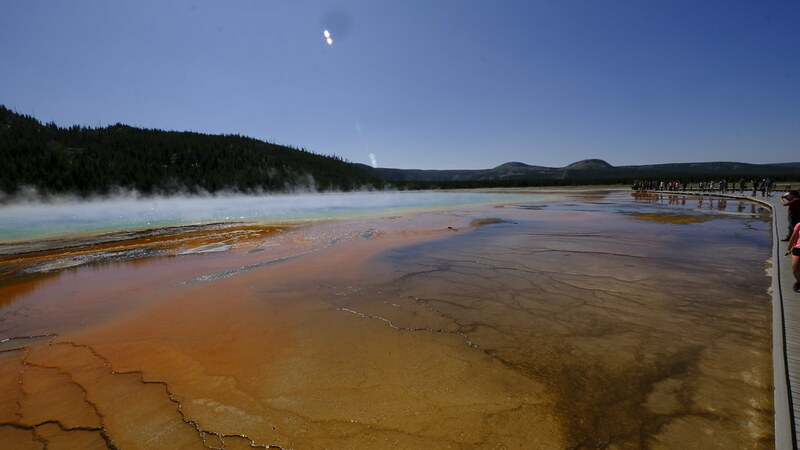 This was one of my favorite geysers (together with Old Faithful and Castle Geyser). 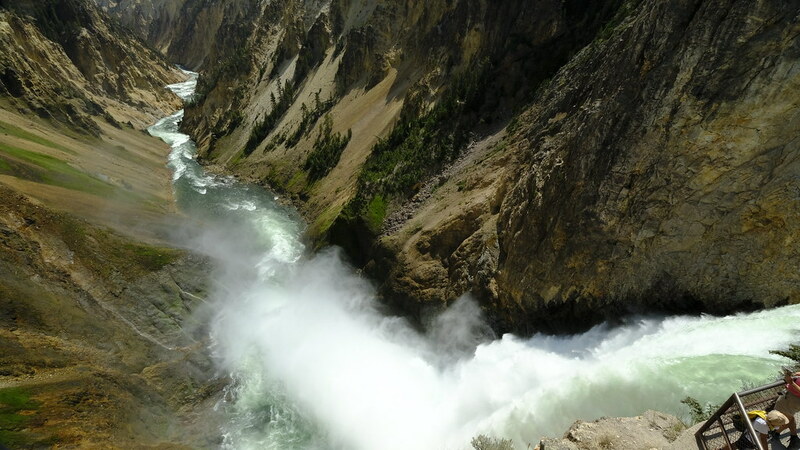 It sits right alongside Firehole River and just kept spewing water and steam for a really long time. Just an awesome sight. Riverside Geyser is almost at the end of the trail, so right after watching that eruption, we finally reached Morning Glory Pool. The pool is smaller than I had imagined from pictures, but it’s just absolutely beautiful. It’s incredible how clear it is in the center, and you can actually see the formation of the crater from which the water emerges. When you stand on the viewing deck just a few feet away, you can feel the heat rising from the pool. Incredible! We finally turned around and headed back to Old Faithful Visitor Center. According to the information at the center, it’s a total of almost three miles, walking until Morning Glory and back. I think it’s very important for anyone visiting the area to plan well. Doing the Morning Glory trail, plus the Geyser Hill loop, plus every trail along the main road (Daisy Geyser, Black Sand Basin, etc. etc.) is beyond exhausting, probably impossible, and completely unnecessary in my opinion. While the geysers and pools are incredible, there’s only so many you can see. After we left Old Faithful, we headed back north towards Madison Junction. I wanted to make one other stop in the area, at Midway Geyser Basin to see Grand Prismatic Spring. There was a line of cars on the road waiting to turn into the parking lot, and we had to wait 10-15 minutes until we could get into the parking lot. Once we were inside, we found parking right away. It’s a rather easy trail, not too long, and the sights are just incredible. Right at the beginning of the trail there’s a pool that gives off incredible heat, and when the breeze came towards me at one point, carrying the steam rising off that pool, the heat was almost unbearable. 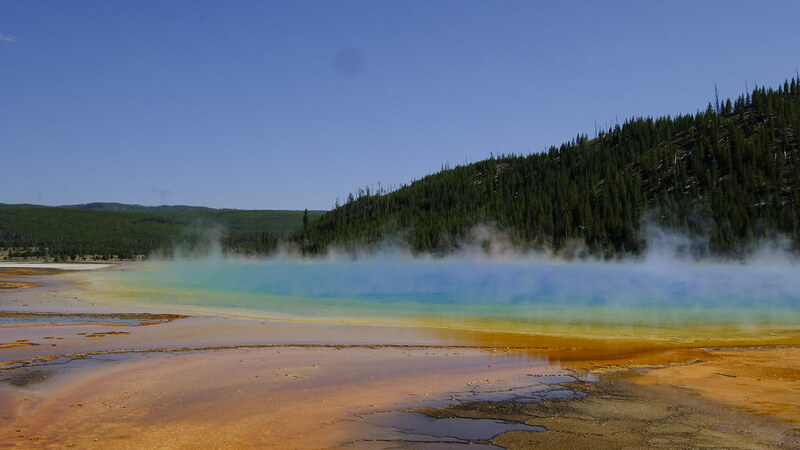 This trail is also a loop, with the farthest part going alongside Grand Prismatic Spring. It’s similar to Morning Glory, only much, much bigger. The vastness of the pool is just incredible, though you can’t look down the center like you do with Morning Glory, because it’s simply too big and you’re standing too far away to look down the middle. When we left Grand Prismatic Spring, it was about four in the afternoon. We were now headed towards Canyon Village, about 34 miles away. The drive took almost an hour, with some traffic on the way. We had reservations at Canyon Lodge, which is actually a collection of seven three-story structures that were built only a few years ago. The rooms here are nice and clean, and not as rustic as the older Canyon Cabins or the Old Faithful Lodge. 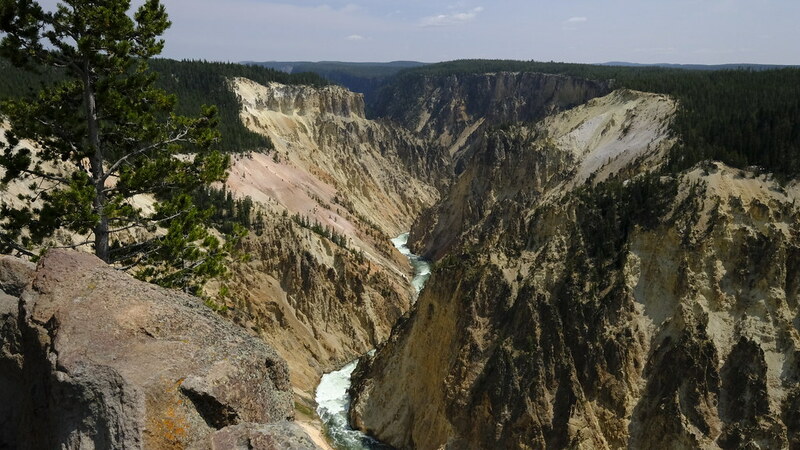 I chose this location because it offers easy access to the Grand Canyon of Yellowstone and Hayden Valley, and relatively easy access to Lamar Valley. It’s quite central yet new, and when you wake up in the morning, you are literally minutes away from attractions. On the flip side, the rooms offer no wifi (paid wifi is available but works only in the main lobby), there aren’t even any TVs, and while our room did have a small fridge, there are no microwaves either. Additionally, no cooking is allowed in the rooms. My husband called up in advance to say that we’re on a kosher diet and need to bring our own food. He asked if there’s anywhere we can use a microwave, if we bring our own (hence the Walmart purchase). On the first floor of every Canyon Lodge building, there’s an area next to the elevator that has a small counter space and an outlet, so we were told we can warm up the food there. It was a bit of a schlep to set up the microwave, warm the food, store the microwave, etc. (and though we had specific permission, I did felt a bit uncomfortable whenever someone passed), but I think it was still worth the hassle to stay at such a great location and save ourselves the time and traffic of driving into the park each morning and out each night. I also want to mention that while reservations at these lodges are typically made a year in advance(! ), there are always cancellations. I got our reservations only one month before our trip. I had originally wanted all four nights, which wasn’t available, and that’s why we slept in West Yellowstone on Sunday night. There was quite a long line at the check in counter, and after we were finally settled in our room, we decided to head out again to Hayden Valley. 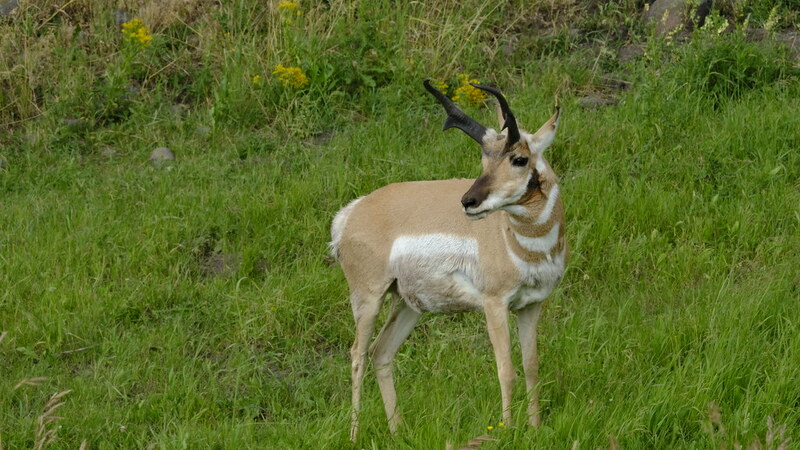 The best time to see animals is at dawn or dusk, and since the valley was just five or ten minutes away and it was already late afternoon, it seemed like the perfect ending to a beautiful day, especially since there would be no hiking required this time! We left the parking lot and reached Hayden Valley within minutes. 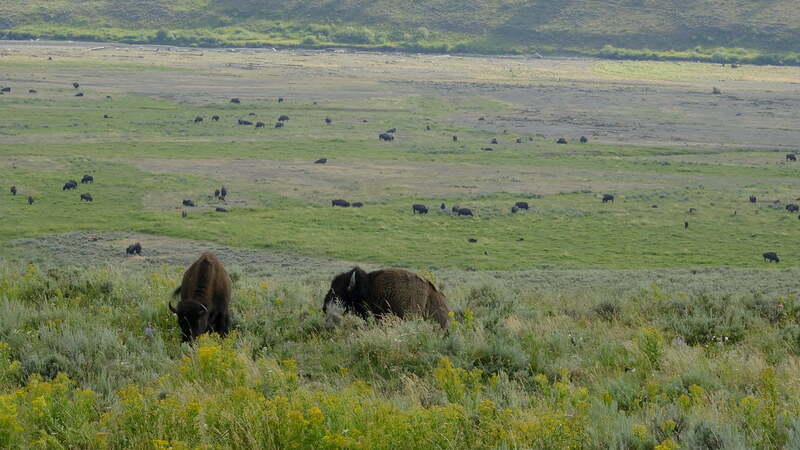 Almost immediately we encountered large groups of bison, some of them right alongside the road. 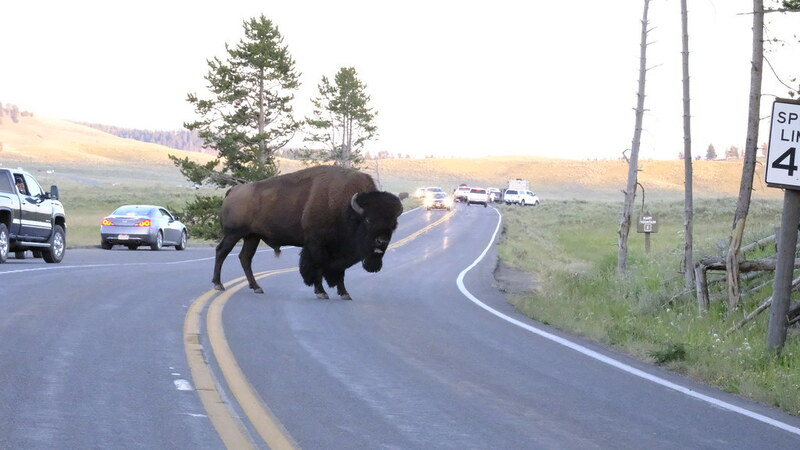 It was very exciting, with cars stopped everywhere, people leaning out of windows with cameras and binoculars, and some bison even crossing the road. 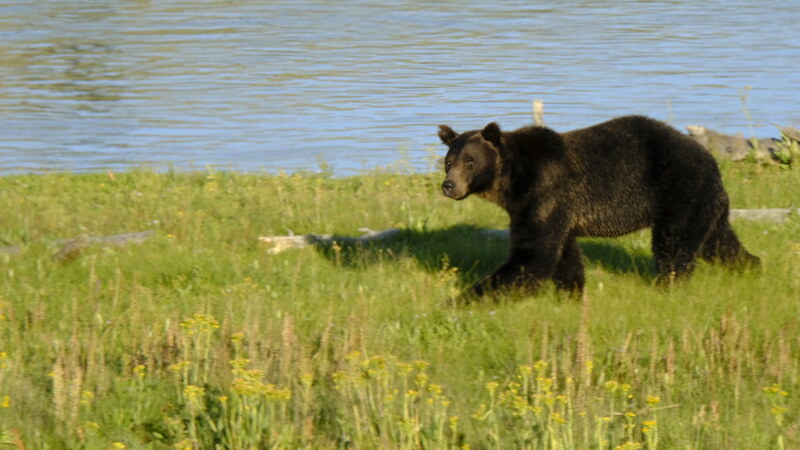 We were lucky enough to see a bear too! After several miles of this, we turned back, and had some more bison traffic and bison-watching on our way back to the hotel. After such a hectic day on Monday, we took things a little easier on Tuesday. We left the hotel after 11, and after literally five minutes of driving, we arrived at the North Rim parking lot of Grand Canyon of Yellowstone. 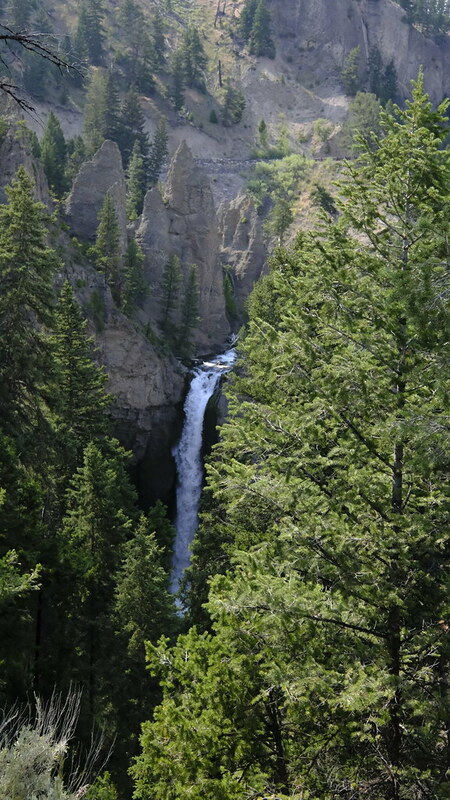 We took a very steep and difficult path down to the Brink of the Lower Falls, and I could barely manage the climb back up. I had no energy to hike that entire day, possibly because I had spent the night at almost 8,000 feet elevation at Canyon Village and was still adjusting to the oxygen levels. The famous Inspiration Point lookout was closed for renovations for the 2018 summer season, but there were still plenty of lookouts along the North Rim Drive that offered absolutely beautiful views of the falls and the river. Afterwards, we drove to the Brink of the Upper Falls, which is accessible via a short, easy path, off a road between the North and South Rim Drives. After a short stop there, we continued to South Rim Drive, but it was very backed up with a long line of cars. I wasn’t up to more hiking anyways, so we just turned around and headed back to the hotel. It was great to be so close to our base, and we could just eat lunch outside and relax in our room for a bit. We wanted to be at Lamar Valley around dusk, but we headed out a little earlier so that we would have time to stop along the way to Tower Junction. That section of the road is really beautiful. Though the trail to the top of Mt. Washburn was closed, we were able to stop at several observation points that offer breathtaking mountaintop views, with the valley and surrounding area stretching for miles. Just before Tower Junction, we also stopped at Tower Falls, and from the parking lot it’s a short, easy hike to view the falls. It’s not quite as awesome as the Canyon Falls, but still worth the stop. We continued to Tower Junction and then turned right into Lamar Valley. 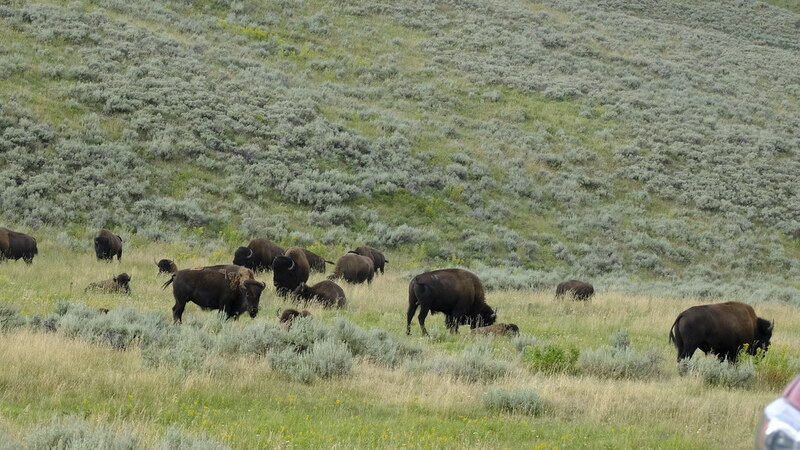 We had hoped to see different animals, but we just saw more bison and more bison and only one other animal. Lamar Valley is more scenic than Hayden Valley, and we got some beautiful shots of bison roaming across wide open spaces with mountains in the background. 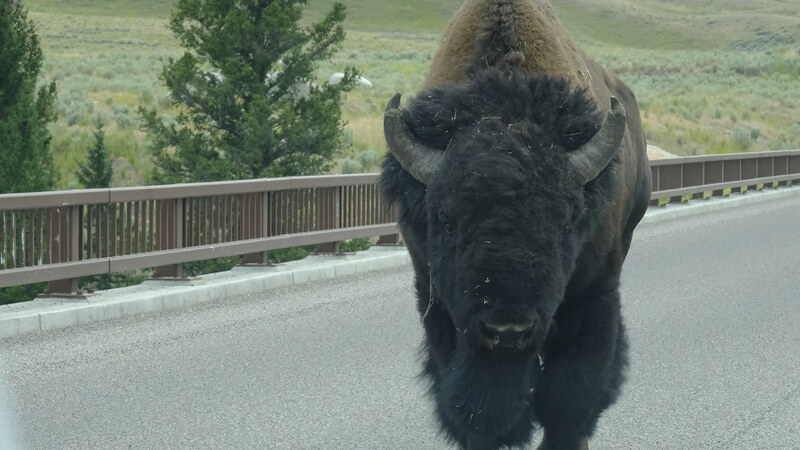 When one bison wandered into the road, my husband jumped out of the car and I took a quick shot of him with the bison not too far away on the road behind him. We were disappointed that we hadn’t seen wolves or bears, but it was still a great outing. 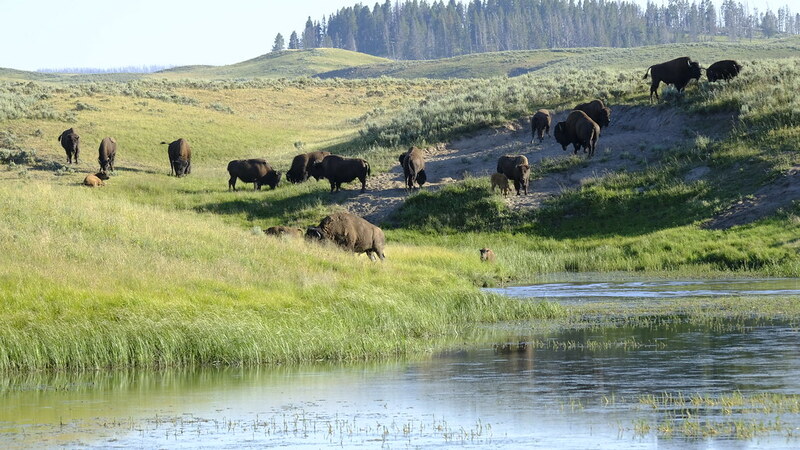 My husband loves watching wildlife, and as far as he’s concerned, seeing literally hundreds of bison in a beautiful natural setting never gets old. Wednesday was our last day in the park, since we would have to head out early Thursday morning. Once again, we took things at an easier, slower pace, so that we wouldn’t come home all wiped out and feeling that we had no time to relax. 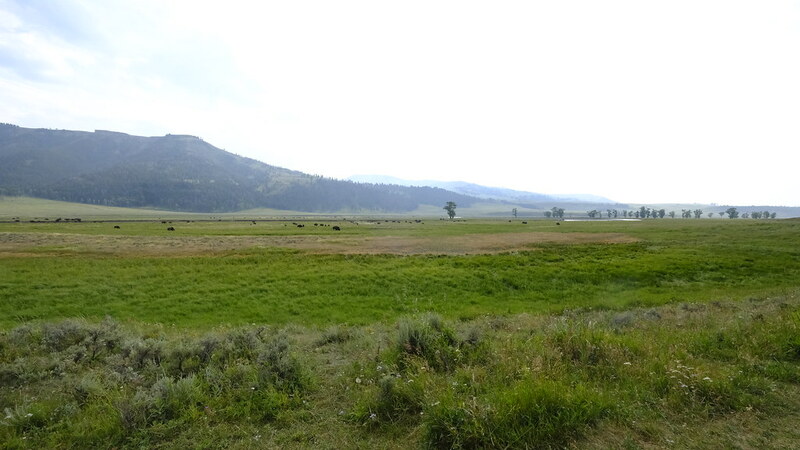 We wanted to explore the Yellowstone Lake area, so we headed down through Hayden Valley again. We stopped at Mud Volcano, where we took a trail to view some really interesting mudpots, boiling pools, and one spring named Dragon’s Mouth Spring. When we reached Lake Village Visitor Center, there were claps of thunder, and a ranger told us that they were expecting thunderstorms throughout the afternoon. We thought we might take a boat or bike around the marina area, but with the sky darkening above us, we just went outside behind the Visitor Center and enjoyed the views of Yellowstone Lake from there. There’s was also a nice beach, and we just relaxed and enjoyed the scenery. When rain started to fall, we headed back to our car and began driving back towards Hayden Valley. 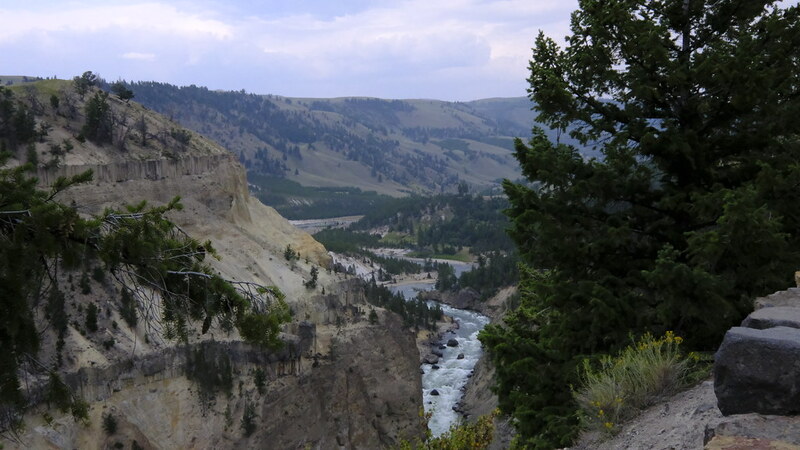 It wasn’t raining in the valley, so we stopped at LeHardys Rapids, where an easy trail led to beautiful views of rapids along Yellowstone River. After driving another few minutes, we stopped at another scenic spot along the river. It was completely deserted, so we decided to eat our lunch there on the riverbank. It felt nice to be spontaneous and relaxed and just do whatever came up. After lunch, we continued driving north toward Canyon Junction and soon saw the sign for the South Rim Drive turnoff. Since we had skipped it due to traffic the day before, we decided to turn in now and see how things were. Uncle Tom’s Point was closed for the season for renovations, but fortunately, there was only a little traffic now around Artist Point. After only a few minutes’ wait outside the parking lot, we were able to drive in and find parking. 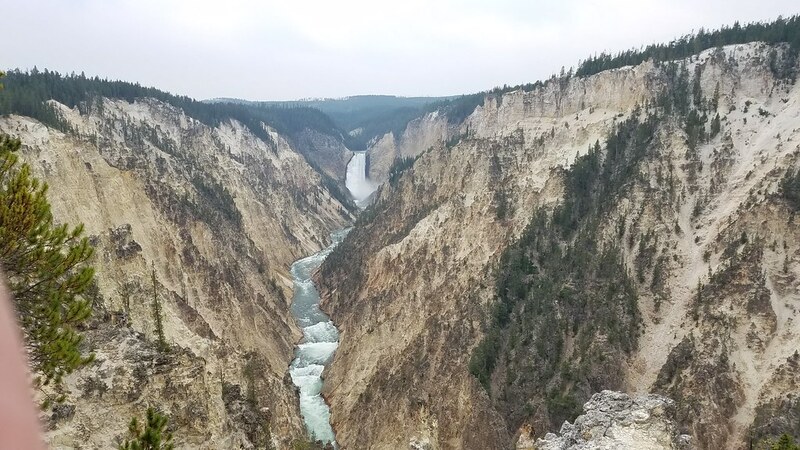 The trail to this overlook is very short and easy and the view of the thundering Lower Falls and the Yellowstone River flowing between the canyon walls is absolutely breathtaking. We took some pictures and then just sat around for a bit to take it all in. After leaving the South Rim, we returned to our hotel. We wanted to try Hayden Valley again at dusk, but since we’d cut short our visit to the Lake Village area, we still had a couple of hours. We decided to return to Norris Basin, which we’d missed on our first day, since it’s only 12 miles from Canyon Junction. 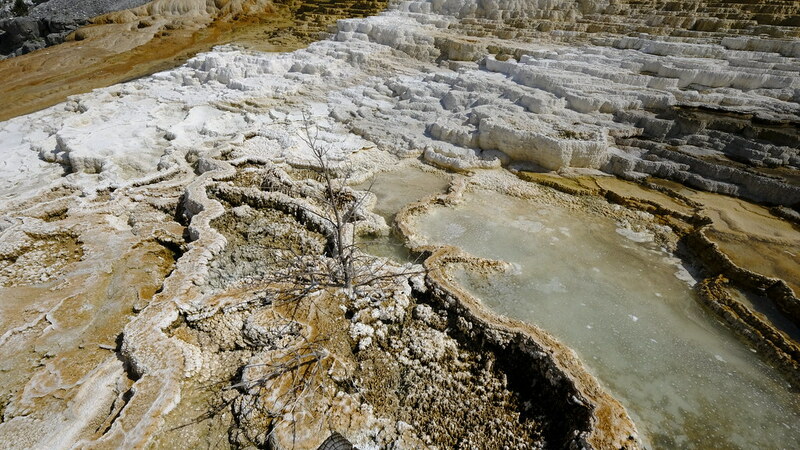 We got to Norris Basin in less than twenty minutes, and we took the trail to Steamboat Geyser, passing Emerald Spring. Steamboat Geyser is the tallest in Yellowstone, though it is very unpredictable and erupts with all its fury only on rare occasions. When we saw it, it was active but it was spewing water just a few feet into the air. We went just a bit farther on the path, took pictures of Cistern Spring, and then turned back. 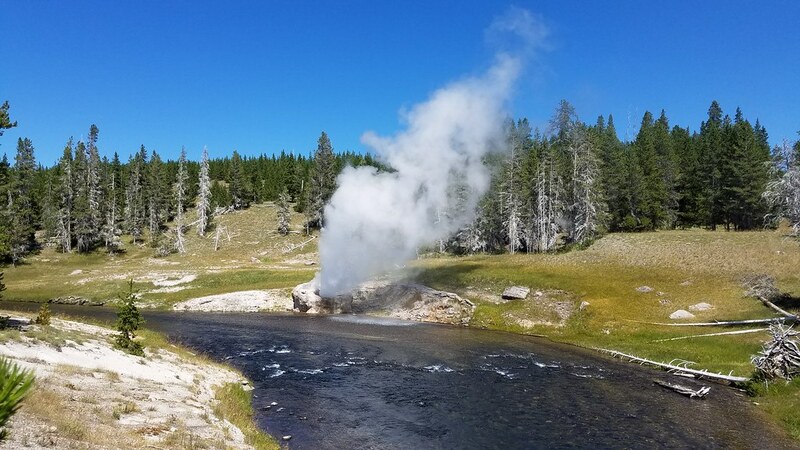 (Interesting side-note: Cistern Spring, which is pictured below, drains completely whenever Steamboat Geyser erupts all the way and then takes several days to refill!) 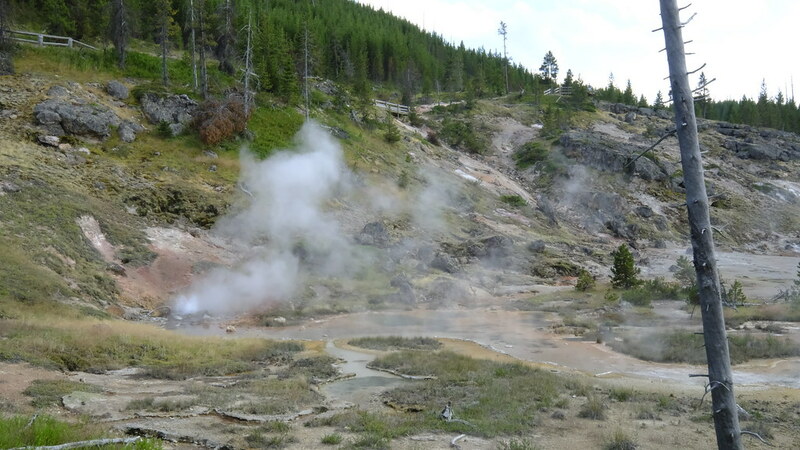 Though there are many more geysers and springs on the trail, we didn’t want to walk so far or spend so much time there. 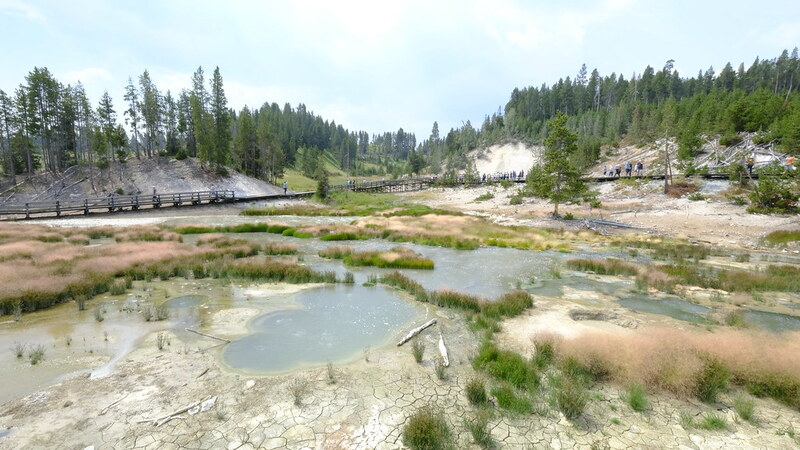 Afterwards we took the trail at the other side of the museum where there is a lookout over Porcelain Basin, a beautiful area which is also part of Norris Geyser Basin. 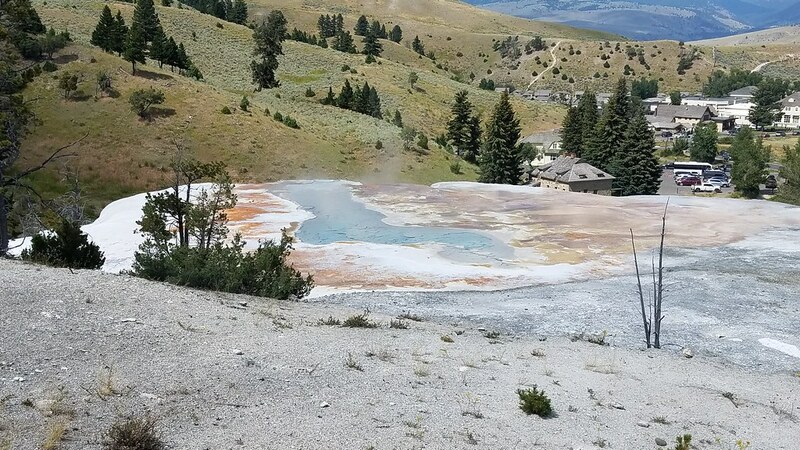 There is a long path that winds between all the geysers and springs in Porcelain Basin, but we just enjoyed the bird’s eye view that we got from that overlook. There was one spot from where clouds of steam kept coming up, like the top of a humongous kettle that someone forgot to turn off. It was amazing to see the huge clouds of steam that just kept coming out of the ground nonstop. After our visit to Norris Basin, we returned to our hotel to make pastrami sandwiches (microwave dinners lasted until Tuesday night) and then finally headed out to Hayden Valley for some dusk wildlife viewing. A little rain began to fall as we left the hotel, and I don’t know if the rain kept the animals away, or our first visit to the valley was unusually successful, but we didn’t see half of the animals that we’d seen on Monday night. There weren’t as many bison out, and even the ones that were wandering about were farther away from the road. 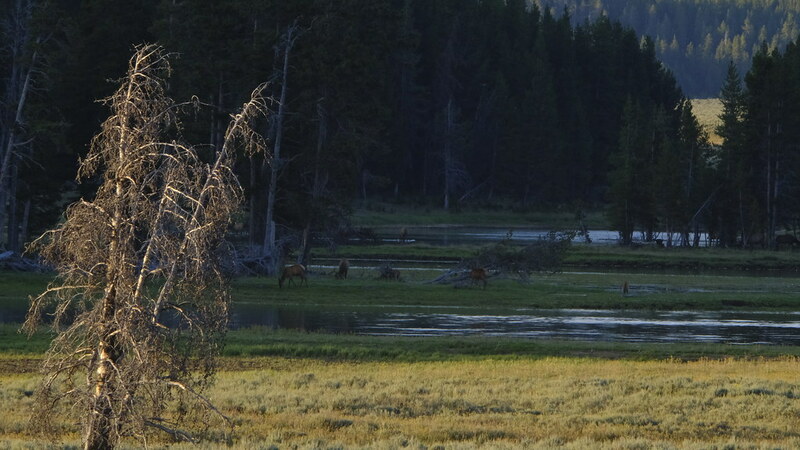 However, my husband did manage to get one great shot of a herd of elk that were some distance from the road. I will try to post that later. We headed back towards our hotel just before it turned dark. As we drove, we kept wondering what to do with our microwave. Give it to housecleaning staff? Leave it in our rental car? My husband wanted to find a Jewish family who could enjoy it and asked Hashem to help us accomplish that. Later that night, he left the room to buy a cold drink from the soda machine and bumped into a Jewish family from London who were about to check into a room on our floor. They had two little girls and were on a five-week American road trip. They were planning to stay in Canyon Village until after Shabbos. We gave them some tips for making the most of their touring time on Thursday and Friday, and we were so excited when they happily accepted our microwave and leftover food. After schmoozing with the family for some time, we finished packing up so that we would be ready to check out early Thursday morning. With our flight departing Bozeman at 12:05pm, we had to leave our hotel early in the morning to have enough time to drive to the park entrance and from there to Bozeman. From Canyon Village to Bozeman Airport should take about two hours and forty minutes, but since traffic is unpredictable inside the park, and there was some ongoing construction between Norris Junction and Mammoth, we planned to leave at 7:30. The airport is tiny, so we didn’t expect car rental return or check in and security to take long. We ended up leaving about twenty minutes later than planned, but still arrived a little more than an hour before boarding, despite ten-minute standstill traffic at the construction area. However, we may have prayed too hard to make it to the airport with plenty of time before boarding because shortly before we arrived, we found out that our flight had been delayed, due to some issues in Newark. We ended up spending four hours at the gate before the plane could finally take off. For those not planning to lodge inside the park, expect traffic to be heavy around the entrances when coming in each morning and driving out in the evening. 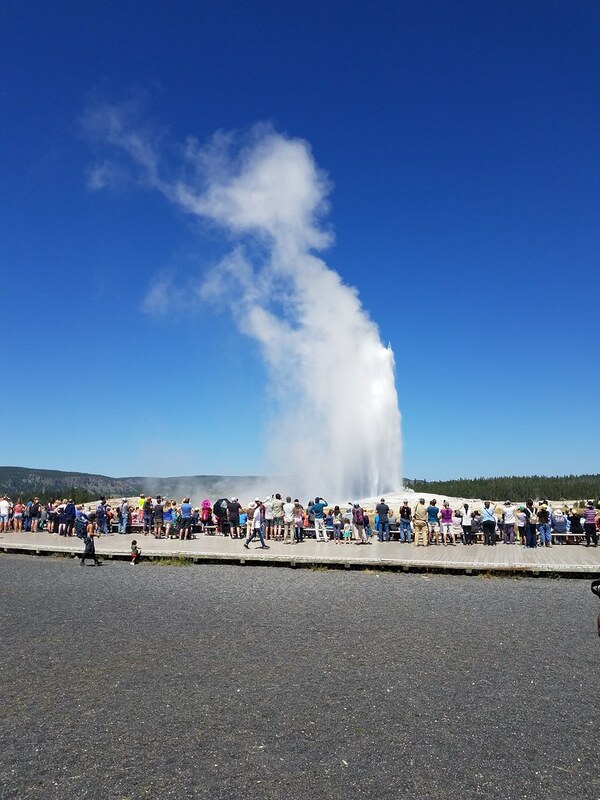 Traffic around popular attractions can also be unpredictable, so it’s best to go with a several must-see destinations (Old Faithful, Grand Prismatic Spring, Hayden Valley, etc.) and then be open to whatever else works out. Monday was our most intense day, and while we preferred a more leisurely pace the last two days, you can definitely cover more and hike more if you prefer. If lodging outside of the park, I think West Yellowstone is the best option, since the West Entrance is quite central, with reasonable driving time to everything, except Lamar Valley and Yellowstone Lake (not the most important destination). 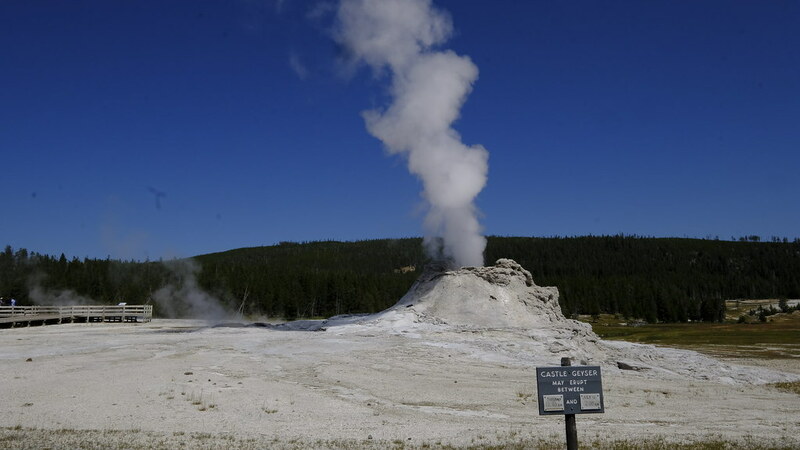 The other entrances are each close to only one section (e.g North Entrance to Mammoth Hot Springs, East Entrance to Yellowstone Lake), but leave some important areas (like Old Faithful area) quite a distance away. In general, when looking at Yellowstone maps that have the total miles between junctions printed on it, a good rule of thumb is to count about twenty or twenty-two minutes for every fifteen miles. This would be the average traveling time in good traffic conditions. 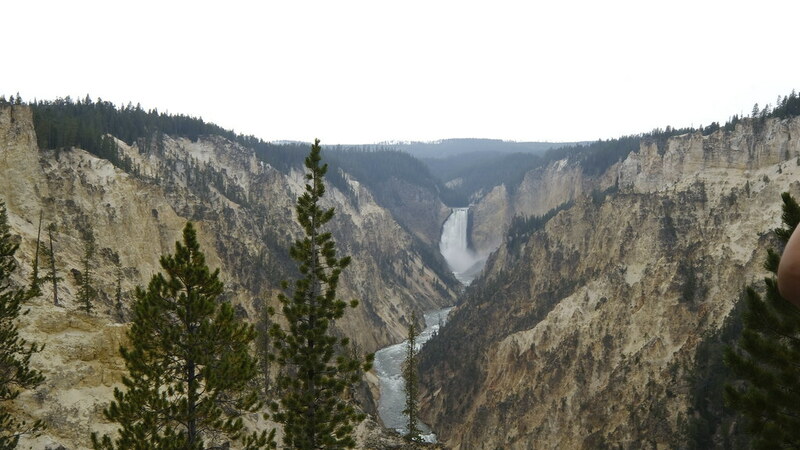 All in all, I think Yellowstone is very unique in that it offers such a variety of features: geysers and hot springs, scenic views from mountain overlooks and of beautiful falls, and lots of fun wildlife watching. It was definitely a memorable trip, and we’re so grateful to Hashem for making this happen for us! If anyone has questions, please feel free to ask, and I’ll try my best to respond. Re: Greece Master Thread Anyone coming to santorini this week? I have a box of kosher food I can give away.